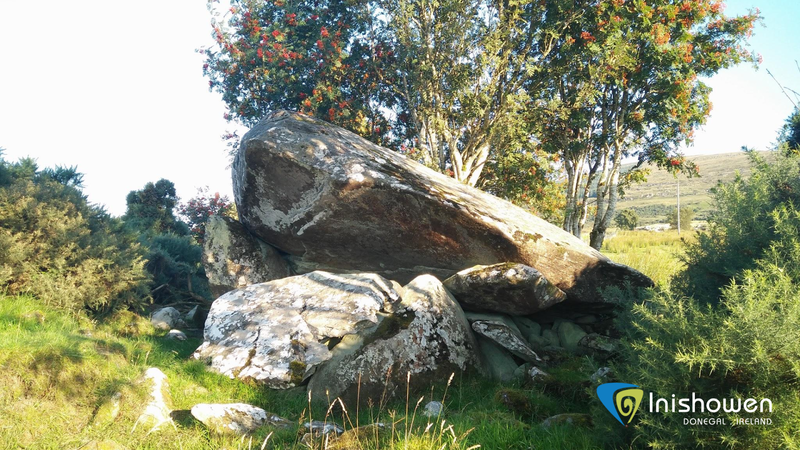 The "Morton God Dolmen" as it is known locally, is an impressive archaeological monument set in the ancient area of Eskaheen/Iskaheen. In the Irish language 'Uisce Chaoin' translates to mean "Pure Water". The name is thought to have originated from a holy well in the area that had curative powers. The monument pictured above is located 3km North West of Muff Village and 3km from the West side of the inner end of Lough Foyle. On a visit to the site you will notice that there are commanding views of Eskaheen Mountain and the Lough Foyle. A Portal Tomb, as it is described in archaeological terminology, is constructed with two large upright stones forming the entrance or portal to a single chamber with a large capstone or roof stone resting on top of the supporting portal tombs. This example has a partially collapsed capstone, which you can see in the video above is split, possibly due to its size which is thought to weight around 30 tonnes! This Portal Tomb is the largest in the Inishowen Peninsula and one of the biggest in the wider area of County Donegal. 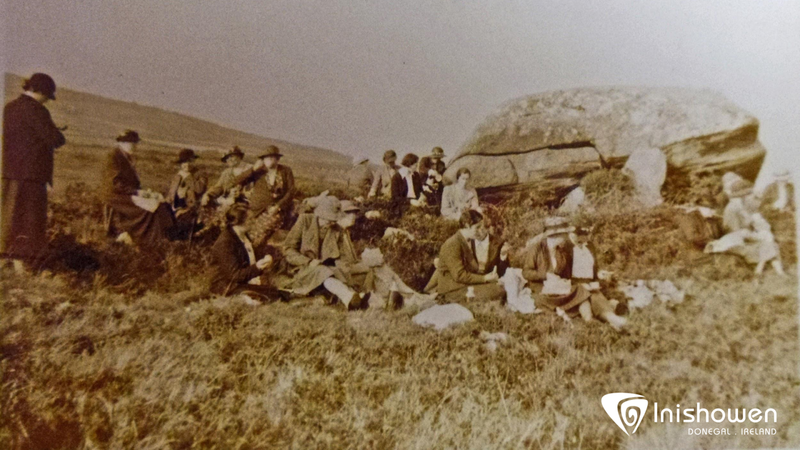 Then and Now: Iskaheens "Morton God Dolmen"
In the 1940s the site was recorded by Mabel R. Colhoun (1905-1992), who was at the time an authority relating to archaeology in the region. During her survey Mabel noted that the site had another name associated with it "The Grey Rock Dolmen" and recorded the remains of a cairn at the base of the monument. A cairn is taken from the Irish word "carn" which means a "heap or pile of stones". The picture above was taken by Mabel in the 1930s during a group outing to the Peninsula. This image provides us with a look at the site before it became, in sections partially overgrown by hawthorn bushes. The origins of the unique name "Morton God Dolmen" is unclear, but what has been determined by archaeologists are sites like the Eskaheen Portal Tomb would have been used to house the remains of important members of the community at the time. The age of these sites vary but largely they date to the Neolithic Period between 3800 to 3200 B.C. Inishowen is blessed with a Peninsula that houses a variety of archaeological and historic monuments. Stay tuned for future blogs as we examine and learn more about these sites and the wealth of myth and folklore that are associated with them. Add any comments or questions related to the article below.